Had some misconception that it was a friendly fire "off" environment. As shown here below, clearly that isn't the case, unless this is some sort of freak bug. Needless to say, one shouldn't be firing on the team anyway, our Cleveland felt it either "funny", "cute", "new and exciting", "insert snarky, clever term here" to open fire on me during our scenario. Our Fuso, the one that called either me a pig or the Cleveland a pig, then opened fire on me, but missed. The Cleveland and the Fuso then opened fire on each other... How nice huh? However, as you can see in the SS, this was during a breaking period of the scenario so no damage was taken by either. But seriously, /shrug , what and why? What goes on in the heads of these people? Why even do it? I even see this at the beginning of randoms, more so in Divisions, which by the way is why I don't division as I got tired of taking unnecessary damage from clan mates/div-mates prior to the match even really starting. Friendly fire damage is off. You cant do HP damage, set fires, or flood a friendly. The one caveat being you can still knock out AA and secondaries. I discovered this a few months ago while a friend and I were beating each other up in the exit point of RR with Perth and Leader. I thought friendly damage was turned off in scenarios. I was unfortunate to get in a scenario with an @sshat clan division a couple weeks back that thought it was more fun to shoot at friendlies than red ships. Cant recall their clan handle now. 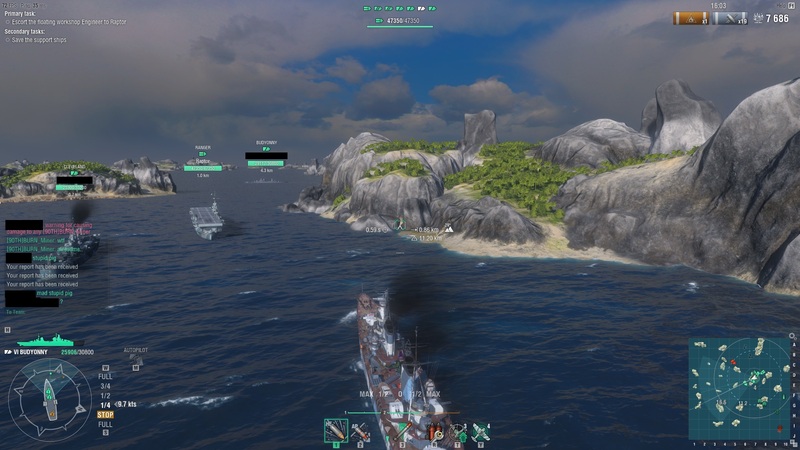 Anywhoo I didn't take any damage in spite of all the times they hit me with gunfire, rammed me and torp'd me. However, it was a complete waste of 20-minutes of my life. The damage warning was for knocking out a module, no hit point damage was incurred. On a related note, while playing a carrier you can torpedo and bomb yourself to death (At least I did). The Raptor’s fighters are bulletproof too, which is nice when they engage enemy fighters and you strafe them all without killing any friendlies. Was just going to post that I looked over the Detailed report and in fact, no damage occurred, but it didn't even register that a module was knocked out either. So the odd thing is, what happened (nothing obviously, but the message was triggered by something)? That is, outside of these guys acting up..
Might have damaged a turret or torpedo launcher that repaired itself. If you have a replay that could answer what happened.